A BURGLAR who lay in wait for four hours in the ceiling of a hotel was foiled when he raided empty tills. 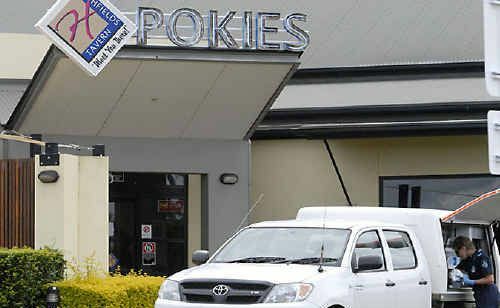 Toowoomba District Court heard Shane Kenneth Nash, a co-offender and a woman friend had gone to the Highfields Tavern on the night of September 16, last year. The trio left but Nash returned about midnight and went to the toilet where he climbed up through a manhole into the ceiling, prosecutor Ryan Peters told the court. About four hours later, the 32-year-old climbed back down and let his co-offender into the building. Nash was armed with a metal pole as the pair searched the tills but they had already been cleared by staff. Mr Peters said the cash room had been locked but a staff member inside could see the intruders on the tavern's CCTV and called police. The pair left empty handed and were found at a nearby residence by police, he said. Nash pleaded guilty to a charge of entering a premises with intent to commit an indictable offence. His lawyer Andrew Bale told the court his client was a father of four, three of whom he had with his current partner of seven years while an eight-year-old son lived with the child's mother in Gladstone. His client's then drug habit had been behind the offending but his client was now clean of drugs, Mr Bale said. Judge Dennis Lynch QC said it appeared Nash had rid himself of drug use. Judge Lynch sentenced Nash to nine months in jail but declared the 150 days pre-sentence custody as time already served and suspended the term after that 150 days with the remainder to hang over his head for 18 months.